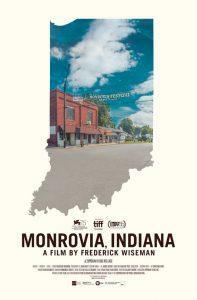 Monrovia, Indiana, Idyll or Elegy? "Wiseman spent ten weeks filming in this small Indiana town of about 1,500 people, creating a fair and insightful portrait of a section of the rural Midwest. He shows us quotidian aspects of life in Monrovia that are likely exotic to a typical big-city documentary-film audience: corn and hog farming, locals holding court at the town diner, a mattress-sale fundraiser for the local school, a farm-equipment auction, a Lion’s Club board meeting, and more. For urban audiences, the lives of service-class workers in the groceries and restaurants of their own cities, while differing in details, are likely just as foreign as the ones shown in Monrovia. Most brilliantly, Wiseman captures the collision between Monrovia’s past and future. He shows how Monrovia, like so much of the Midwest, is dominated by a pervasive, smothering sense of nostalgia, which goes far beyond healthy community pride. In an early scene, a schoolteacher explains the town’s storied history of sports success. Legendary UCLA basketball coach John Wooden, winner of 10 NCAA championships, was born in Hall, about five miles away. Branch McCracken, a two-time NCAA championship-winning basketball coach at Indiana University, hailed from Monrovia proper; the high school named its gym in his honor. The teacher chronicles how, in the 1920s, Indiana was one of three major basketball hubs, and recounts the many tournaments won by local teams in that era. Afterwards, as if instructing the kids in their local culture, he notes how difficult it is to change any aspect of the school’s football field, because so many families either donated or have some personal tie to it".